We tend to take books for granted and assume that as "functional objects" they can be opened and read at will. 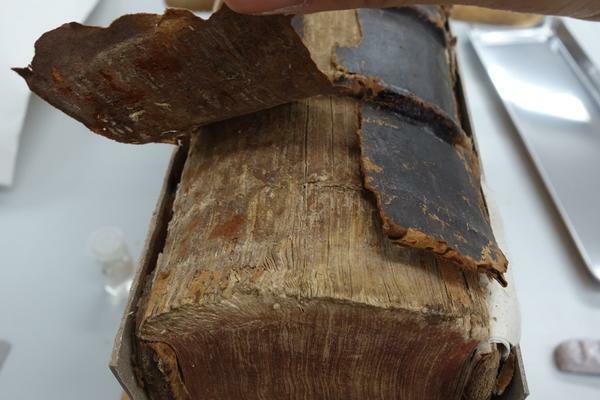 In book conservation we often have to face situation where the handling, opening and consultation of a book could cause irreversible damage. We have to find solutions to both protect the book as an historical object and to restore its usability as a repository of knowledge. I recently had the privilege to treat such an object, an exciting but very challenging project both from a technical and ethical perspective. 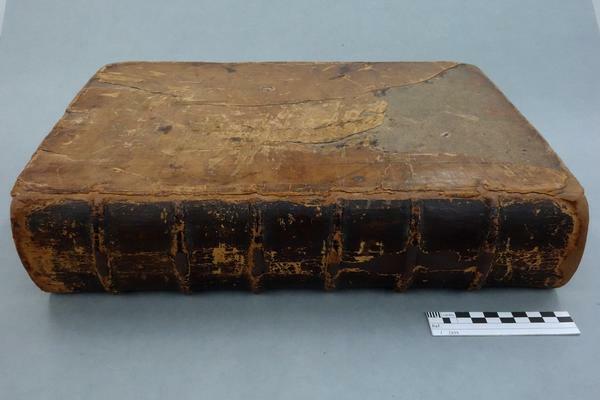 An Institution of General History, or The History of the World is a 17th century book held at the Chichester Cathedral Library with a full leather binding in brown sheep skin. 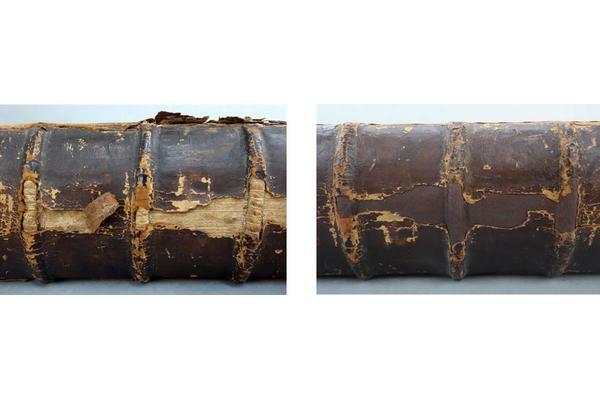 (Fig.1 - 3) I could see immediately that the spine was damaged and had very brittle leather. But it was only when I tried to open the book that I realised the extent of the challenge: The book weighed a massive 10 kg (I weighed it to be sure!) and had a tight back structure. Fig.1. An institution of General History of the Ecclisiastical Affairs of the World, by William Howel 1685. Held at Chichester Cathedral Library. Fig.2. 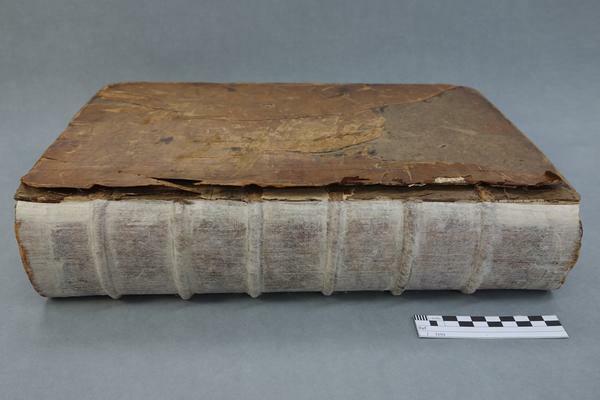 A full leather binding in brown sheep skin. Fig.3. 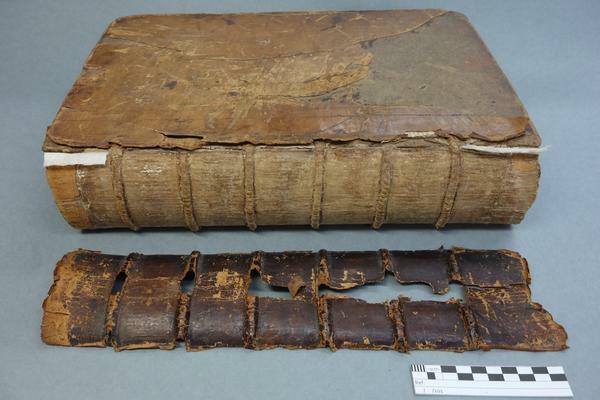 Damaged spine and brittle leather. 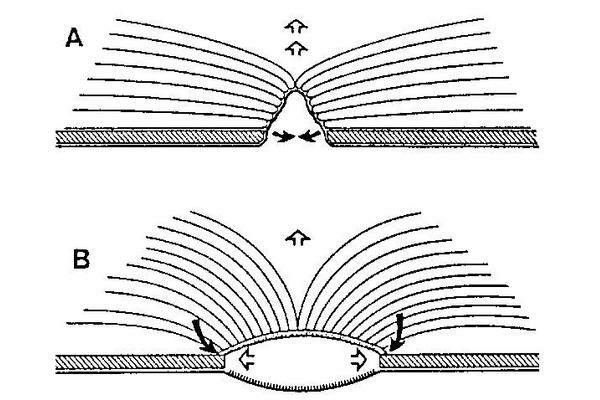 As demonstrated by this illustration by Szirmai (Fig.4), in tight back structures (A), common until the early 19th century, the cover material is directly glued to the spine. In the alternate approach called hollow back (B), the cover material is not attached to the spine leaving a "hollow" between the textblock spine and the cover. 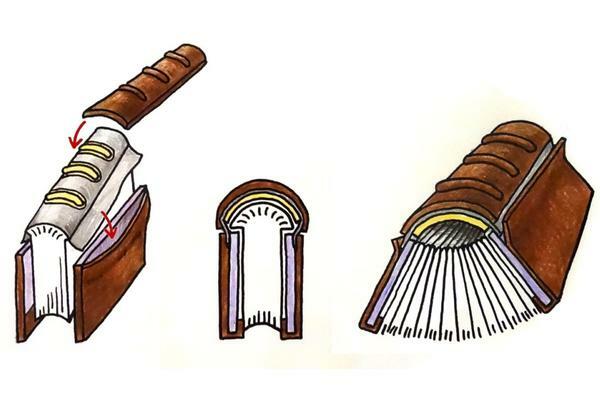 A typical issue of tight back bindings is that they expose the book spine to increased mechanical stress and limit the ability for the book to open flat. These issues are amplified by the size and weight of the volume and by the grammage of the textblock paper. This was exactly the case of the History of the World. 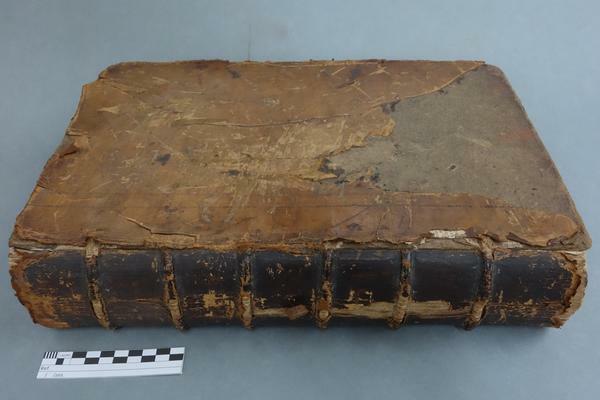 The structure made the book difficult to open, and over many years of usage the huge tension it was exposed to had damaged the spine leather. Moreover continued usage was very likely to create further structural damage not only to the spine leather but also to the textblock itself. How to tackle this problem? This was not a straightforward decision and I had to find an acceptable balance between the ethical tenets of "minimal intervention" and the practical requirements of "functional recovery." Let me explain. 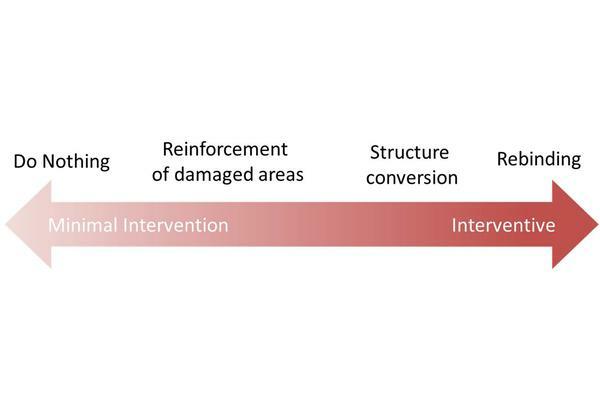 Conservation theory, and most professional guidelines, tell us that treatment decisions should be guided by the concept of "minimal intervention". This concept is inherited from world of "fine art" conservation and tells us to put the integrity of the original object first and to restrict treatments to the strict minimum necessary to protect it against damage. 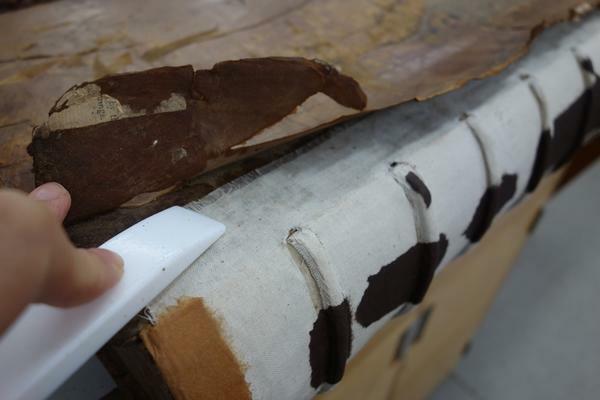 According to this guidance, a conservator should not attempt interventive "restoration" of an object by reconstructing missing areas or recovering damaged areas but only to stabilise the material and limit further damage. 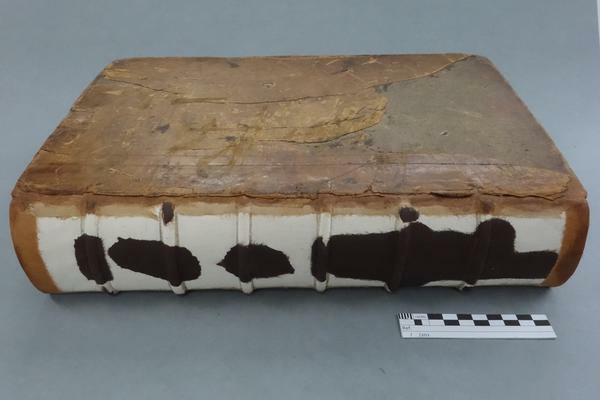 But books present a major challenge, they are very rarely art pieces solely for display but functional objects that will need to be manipulated and read after treatment. This means that in many cases limiting a book treatment to "minimal intervention" leads to a major loss of function: the book cannot be practically used and read OR is exposed to high risks of damage if used. 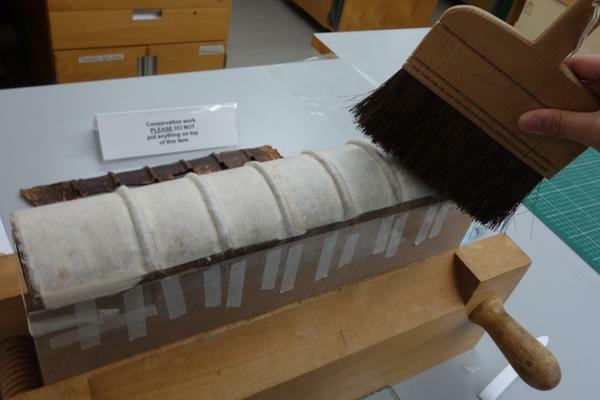 Because of this, book conservators often have to consider far more interventive "functional recovery" techniques not only to repair existing damage but to protect the book for a future "active life". The challenge, on a case by case basis, is to find the right balance of techniques to both protect the object as an historical artefact and as a functional object. The condition of the book, the priorities of the client, the relevant techniques and the budget available all participate in this complex decision process. In this case, as illustrated below (Fig.5), I had a wide range of options to choose from, ranging from a "do nothing" cop out to a very aggressive and interventive complete rebinding of the book with new material. The options at the "minimal" end were attractive because relatively simple and low risk, but they would require me to turn a blind eye on the damage the book would be exposed to in the future. I could not resolve myself to do this. At the other end, the more "interventive" options could be disrespectful of the object's historical integrity, not something I was happy with either! After consultation with the client it was confirmed that future usability of the book was a key requirement but that historical integrity should be respected as much as possible. The techniques I knew provided no "obvious" way to both preserve the historical integrity of the book and ensure its usability…some research was needed! I first found references to techniques allowing the change of a books structure from tight into hollow back by inserting fake hollows made of stiff card between the cover and the spine. These techniques were unfortunately not suitable in this case. 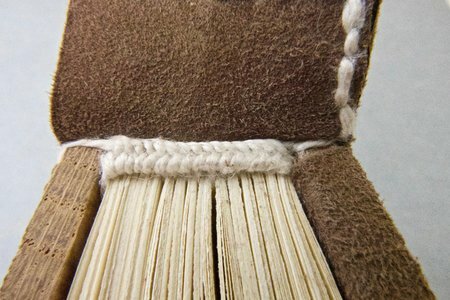 This book has a raised cord structure where the shape of the sewing cords shows through the cover leather. The insertion of smooth fake hollows would not be compatible with this structure. Fig.6. Honey Hollow Technique - yellow layer is a cast, grey is a fabric layer. Left: Pasting spine cover on the cast + insertion on boards. Center: Cross-section of the closed book. Right: Cross section image of the opened book showing hollow. 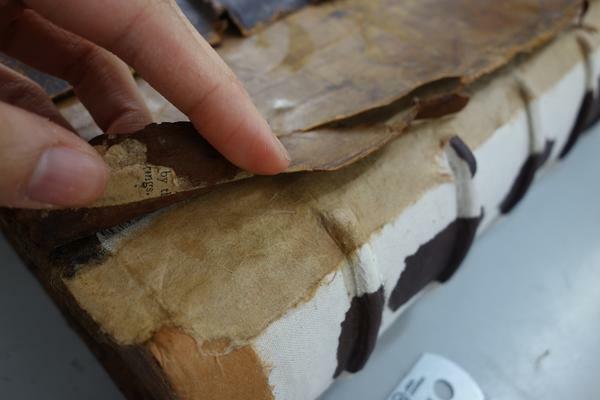 In this technique the structure of the book is converted from tight back to hollow back while keeping the books original aspect and materials. 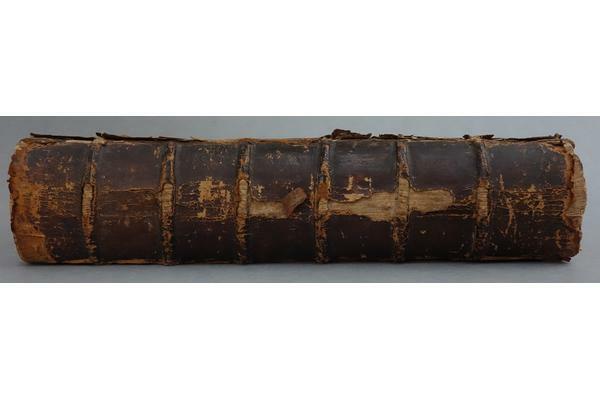 A cast is made of the - now exposed - original spine. 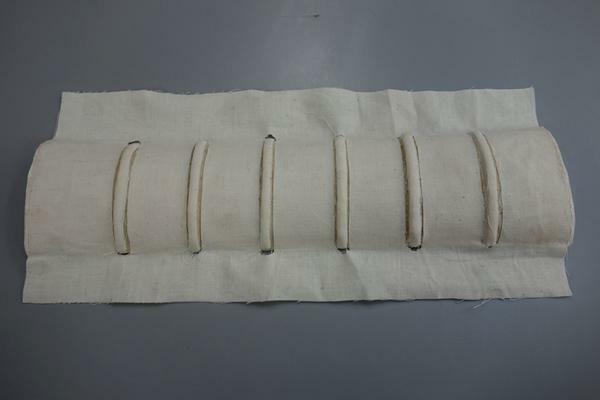 This Honey Hollow technique uses a "cast" of the original spine which is used to support the original spine as a hollow, and the fabric layer joints the cast with spine and boards. Again, the technique is based on alteration of structure and can be considered as "invasive" but the client kindly agreed with my idea and enable me to do this challenging project! Fig. 7. Lifting the spine leather. Fig. 8. Book and removed spine cover. Fig.9. 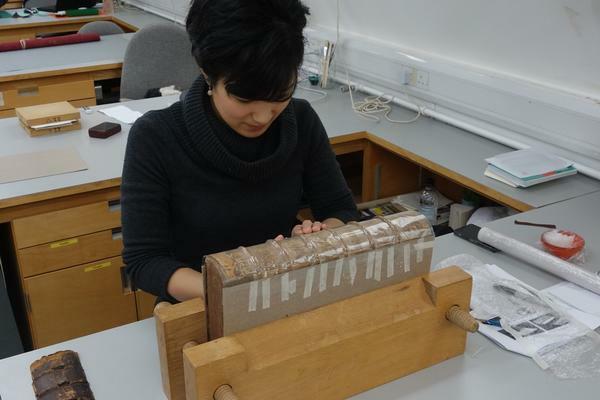 Lining the spine with Japanese tissue. Fig.10. 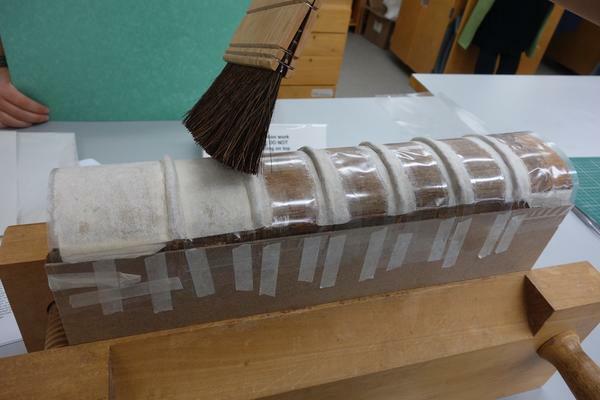 Applying cling film on the spine to protect during casting. Fig.11. Starting to apply Japanese paper strips to make the cast. Fig.13. 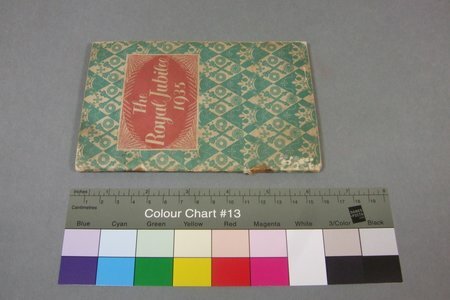 From right to left: original cover, cast, aerocotton and colour matched papers. Fig.14. Cast and aerocotton pasted together. Fig.15. 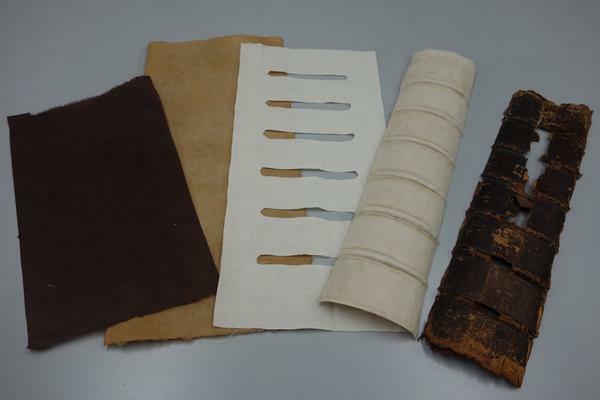 Insertion of cloth flap between board and covering leather. Fig.17. Cast attached to the book! Fig.18. 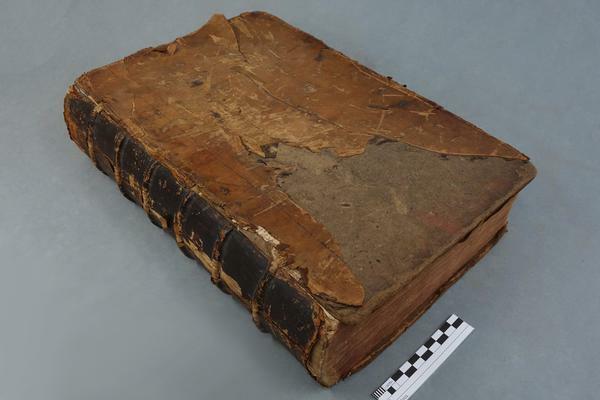 The book after treatment. Fig.20. Opening of the book. 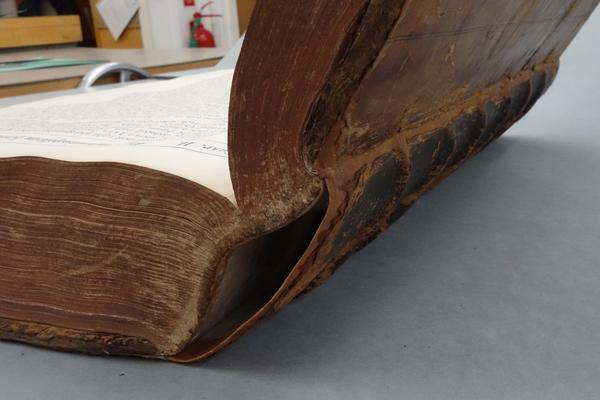 However the book remains very heavy and should not be opened flat to avoid damaging the text block spine. Additionally I issued handling recommendations such as the use of supporting forms when consulting the volume. 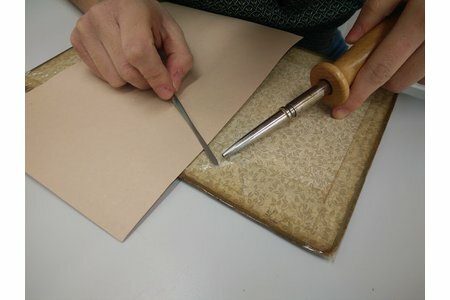 This was a very challenging test not only of my technical skills but in "real life" risk assessment and decision making in book conservation. I feel privileged to have had this opportunity and so glad to have found and successfully applied a satisfying solution, for myself, for the client and for the book.